Stephan Brendel is Regional Manager of APMG-International for EMEA. 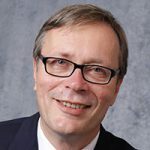 He has been in the Best Practise community for more than 10 years and is deputy chair in the Best Practice User Group and an extended board member of itSMF Germany. His IT Service Management background allowed him to dive quickly into the development of DevOps practices and he is constantly promoting and educating the DASA competence model around the world. Prior to his role at APMG he has been heading up a consulting firm and has been working for General Electric for many years.